Choosing the right video interface may mean the difference between success and failure for vision system designers. Machine vision was born on the factory floor and has matured to automate tasks in transportation, medical, and security applications. As imaging systems become more complex, designers face a growing set of challenges. Consider that, while systems support increasingly detailed analysis, they must be easier to use. Also, budget pressures often mean systems must deliver enhanced performance without sacrificing investments in existing imaging equipment. Viewed through the lens of these challenges, a key design decision is choosing the video interface – the technology used to transfer data from an image source to a computer or display. Although the video interface is a small part of the overall vision system, it has a large impact on the cost and usability of the final product. To meet the needs of high-performance vision applications, the video interface must transfer uncompressed video from source to endpoint with high reliability and low, consistent latency. A bin-picking robot on a manufacturing line, for example, must detect an object, model the surrounding environment, accurately select the part, and plans its next path – all within milliseconds. Initially, video interfaces were often based on proprietary designs. These custom solutions met performance demands, but were expensive to develop and introduced integration issues in multi-vendor systems. Existing analog broadcast and telecom networking standards also were adapted for vision applications. As imaging moved from university labs to factory floors, the vision industry recognized the need for dedicated standards to accommodate end users designing systems integrating cameras, frame grabbers, and software from different vendors. Camera Link, introduced in 2000, was the first purpose-built machine vision standard. Camera Link provides a straightforward camera/frame grabber interconnect standard that includes provisions for up to 2.08 Gbps data transfer, camera timing and power, and real-time signaling over a dedicated 10-meter cable. The standard was later updated, with Camera Link HS extending cable reach and bandwidth. Camera Link has a large installed base because of its high throughput and low latency. However, its 26-wire connection cables and limited cable length add installation complexity and expense. Camera Link HS is well suited for higher-speed line scan cameras, but its shorter cable length has limited adoption. Providing further bandwidth and cabling flexibility, CoaXPress was released in 2010 to support very high-speed line cameras. CoaXPress uses a single coaxial cable to transmit data at up to 6.25 Gbps, control data, and power. The standard delivers speed, reach, and cabling advantages, but has no networking capability and, as a result, has gained narrow industry acceptance. As imaging systems perform more complex tasks and end users seek economical, easier-to-use solutions, these standards’ limitations become more apparent. Each requires a dedicated connection between the image source and endpoint. In applications where images are displayed across multiple screens, cabling becomes costly and complex. Moreover, these interfaces require a PCIe frame grabber at each endpoint to capture data. This limits the types of computers that can be used, drives up costs, and increases system complexity. 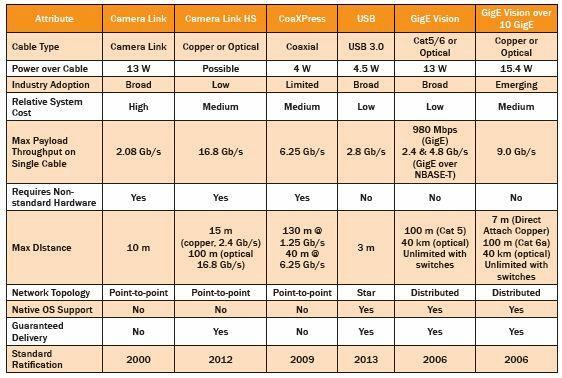 Recognizing these limitations, camera and component manufacturers jointly developed the GigE Vision standard. Introduced in 2006, GigE Vision regulates video transfer and device control over GigE, and was later expanded to encompass 10 GigE and wireless. Imaging data is transmitted directly to the Ethernet port on a computer (including laptops) and embedded or single-board platforms over a more flexible, longer-reach cable. GigE Vision makes it easier for designers to enhance reliability, future-proof designs, and extend the life of quality inspection systems designed around legacy analog or Camera Link interfaces. In web inspection (Diagram 1), external frame grabbers convert images from existing Camera Link cameras into a more flexible GigE video stream. The uncompressed video is transmitted directly to ports on an image processing computer. With longer-reach Ethernet cabling, processing equipment can be moved from the harsh manufacturing environment to a centralized operations center. 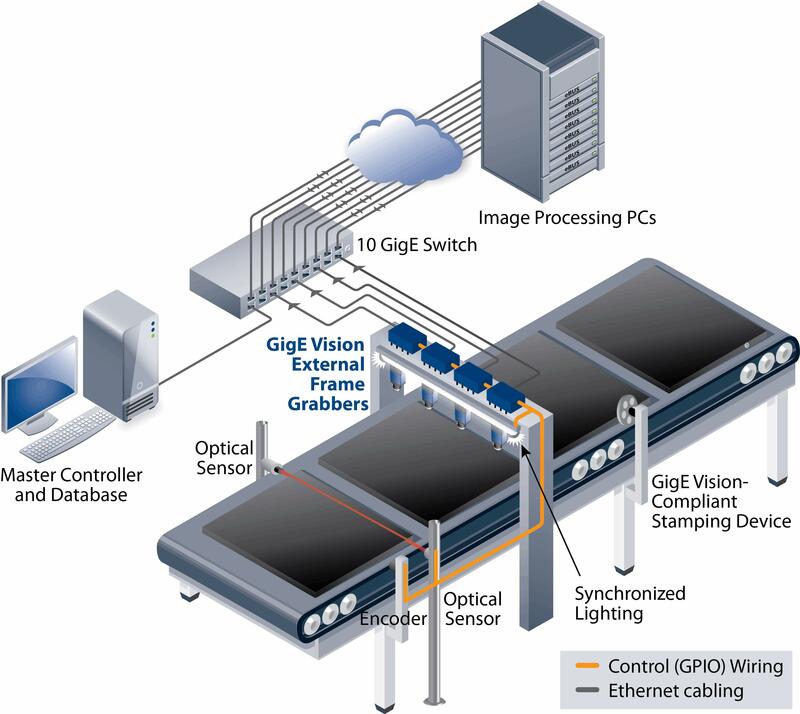 GigE Vision supports point-to-point performance, with the networking flexibility to multicast imaging data to multiple computers simultaneously using an off-the-shelf Ethernet switch. This allows designers to optimize individual computers for different types of defects, rather than matching a PC to each camera. If a primary PC is taken offline for maintenance, inspection functions can be assumed by backup PCs without the need to switch cables or change software settings. Diagram 1: External frame grabbers convert image feeds from existing cameras into a GigE Vision video stream to help enhance reliability, future-proof designs, and extend the life of web inspection systems. Ethernet is a mature technology that is globally installed across multiple industries and applications. For the machine vision industry, this allows the reuse of technology already tested and perfected by other industries. For example, the IEEE 1588 protocol — widely deployed to synchronize telecom networks — is used in machine vision systems to synchronize network devices with sub-microsecond accuracy over the Ethernet connection. More recently, the vision industry has been adopting NBASE-T technology to increase the bandwidth of standard Ethernet cabling to support up to 5 Gbps data transmission. While USB interfaces have been widely adopted in consumer applications, the bandwidth supported by earlier versions of the standard was insufficient for vision applications requiring uncompressed raw data for real-time image analysis. This changed with the USB 3.0 standard — or SuperSpeed USB — which provides 10 times the bandwidth of USB 2.0. Taking advantage of this speed and building on the concepts developed for GigE Vision, the machine vision industry standardized the transport of imaging and video data over a USB 3.0 cable with the release of USB3 Vision in February 2013. 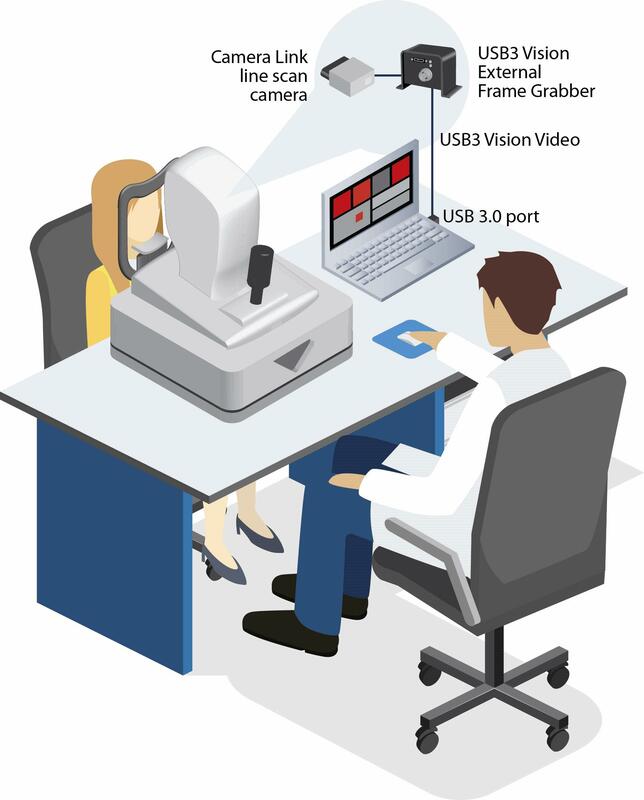 With USB3 Vision, video and data is transmitted from cameras and sensors directly to existing ports on a computer, laptop, or tablet over flexible USB 3.0 cabling. The USB 3.0 bus delivers sustained throughput approaching 3 Gbps, surpassing the performance of Camera Link Base configurations and rivalling Medium configuration, but without requiring multiple cables or specialized PCIe frame grabbers. One fast-growing market for USB3 Vision is retrofit upgrade, where integrators can leverage the standard’s ease-of-use and computing platform advantages. For example, Optical Coherence Tomography (OCT) systems for eye inspection often use a high-sensitivity Camera Link line scan camera to map reflections of laser light from different kinds of tissue, generating a cross-sectional image of the human eye. The Camera Link video interface requires bulky, specialized cabling and a PCIe frame grabber to capture images at the computer, resulting in more complex systems, higher costs, and limited component selection. Instead, system integrators can convert the camera feed to a USB3 Vision image stream with a USB 3.0 external frame grabber. The uncompressed high-bandwidth video is transmitted with low, consistent latency over a USB 3.0 cable directly to an existing port on a laptop used for analysis and display. By eliminating the need for a Camera Link frame grabber in a PCIe slot, designers can deploy lower-cost computing platforms while retaining specialized imaging sources. The plug-and-play USB 3.0 cable also allows faster setup and teardown of inspection stations. Diagram 2: Treating Camera Link cameras like plug-and-play USB 3.0 products reduces component costs and cabling complexity in an eye inspection application. The industrial sector was among the first to recognize that machine vision could automate routine tasks and enable faster, more accurate quality inspection to boost productivity and profit. Vision standards and a growing selection of compliant products are now making it easier for system designers to meet performance and cost challenges in established and emerging markets. Today, GigE Vision is the most widely deployed video interface standard for industrial applications, and it is gaining a strong foothold in the medical, defense, and transportation markets thanks to its ubiquitous platform support, multicasting, and interoperability capabilities. As technologies continue to evolve, USB 3.0 will become the video interface of choice for an even wider range of imaging applications. Ed Goffin is a marketing manager with Pleora Technologies, a supplier of video interfaces for system manufacturers and camera companies serving the industrial automation, military, medical, and transportation sectors.